Join Habitat for Humanity Portland East Metro on Wednesday, November 8th from 8:30-3:30 to help turn the future home site at 6360 Northeast Simpson Street into a positive community space. Habitat purchased the Simpson Street property summer of 2016, however due to other construction priorities, Habitat will not start building on the property for another couple of years. In the meantime, Taren Evans, Neighborhood Revitalization Manager for Habitat for Humanity, has been working with community members to explore how the space could meet other community needs. “We want to be sure that [this property] is a safe place for Habitat families to move into,” Taren explained. In an effort to make Simpson Street a safer and more positive space, volunteers on November 8th will join Lowe’s employees to install a fence and raised beds, as well as assemble a shed. These projects build on the work Taren and other community members have already done at the site. Habitat installed a temporary fence and signage in the early stages of the project to send a clear message that the lot is no longer vacant. Additionally, community leader Isabel Eusebio helps lead a walking group that meets twice a month to pick up trash and keep the area clean. “[The property] was unmaintained,” Isabel said. There were mountains of trash where people had dumped their waste and many invasive plants. Cleaning the lot has been tough work, she explained. “I like to keep the planet clean,” explained Isabel, emphasizing the importance of maintaining the environment for the next generation. This work has tangible effects. “People felt like [the site] had been neglected, so people were excited to see something positive happening on the property,” Taren said, referring to the community response she gathered at a Community BBQ on the Simpson Street property in early September. Isabel added that while some trash is still dumped on the site, people are noticing their work, and the property is looking much better than it was before. There are other exciting projects to come. Taren hopes that a current Habitat family can use some of the site for an urban farm. 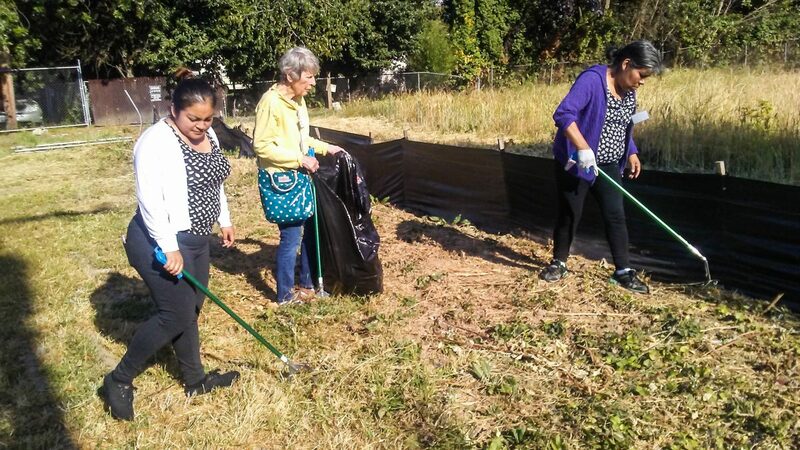 This would mirror the relationship built between the non-profit Emma’s Garden and Helensview on Northeast Killingsworth and 64th. In 2014, Emma’s Garden built a market garden on an empty lot where community members could grow and sell their own produce. Additionally, community leader Patricia Vasquez has been working with Hacienda’s Expresiones students to paint murals of community leaders. The murals will be temporarily installed at the Simpson Street property this winter and will stay until construction begins. Habitat for Humanity’s vision is “a world where everyone has a decent, affordable place to live.” These projects support the development of safe and affordable housing by starting at the neighborhood level. If you are interested in volunteering on Nov. 8th, please contact Taren Evans at taren@habitatportlandmetro.org or 503-287-9529 ext.30 to RSVP. For more details about the event, click here.